The church of St Mary in Conshohocken, Pennsylvnia, recently given to the Fraternity of St Peter by the Archdiocese of Philadelphia, will keep the following schedule for the services of the Triduum and Easter Sunday. The church is located at the corner of the corner of West Elm and Oak Streets. 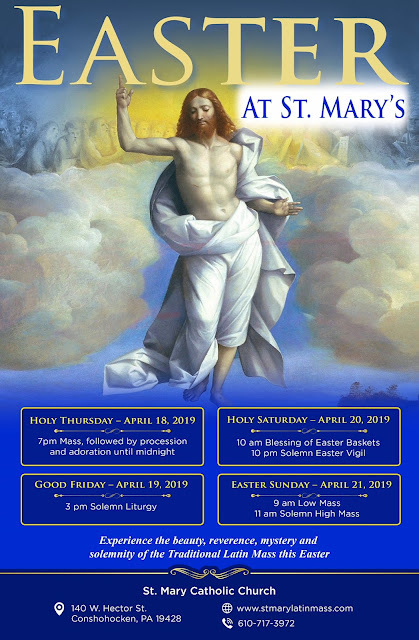 Holy Thursday: Mass at 7pm, followed by the procession, and adoration until midnight. Easter Sunday: Low Mass at 9am, Solemn High Mass at 11am.